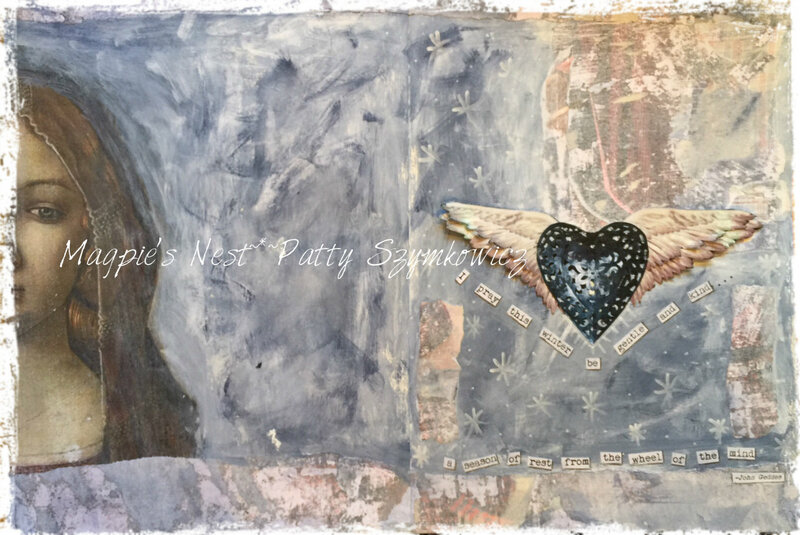 This entry was posted in Art Journal Journey Challenge Blog, Collage, Heart, Misty Mawn, Mix it Monthly, Mixed Media, Paint, Quote and tagged Art Journal, Collage, Misty Mawn, Mixed Media, Quotes. Bookmark the permalink. 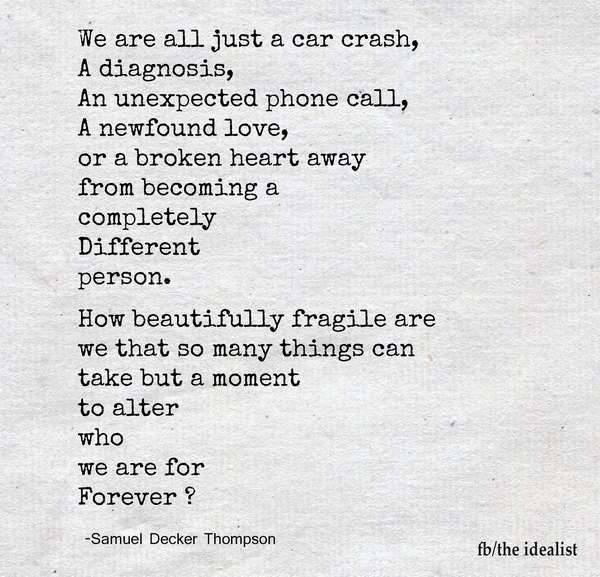 Fragility…..hmmm resonates with me at present….sprained ankle that’s keeping me from lots of stuff I should, and would like to be doing. LOVE the phrase ‘wheel of the mind’…O how true that is. making art is a way to heal .. so right! Wishing you a happy new week ! Thank you so much for another fabulous entry to the January collection at AJJ! Your pages are truly beautiful and the words at the end really moved me. We never expect that life can change in an instant, and it is especially hard when we lose those we love around holidays that are supposed to make up feel joyous. 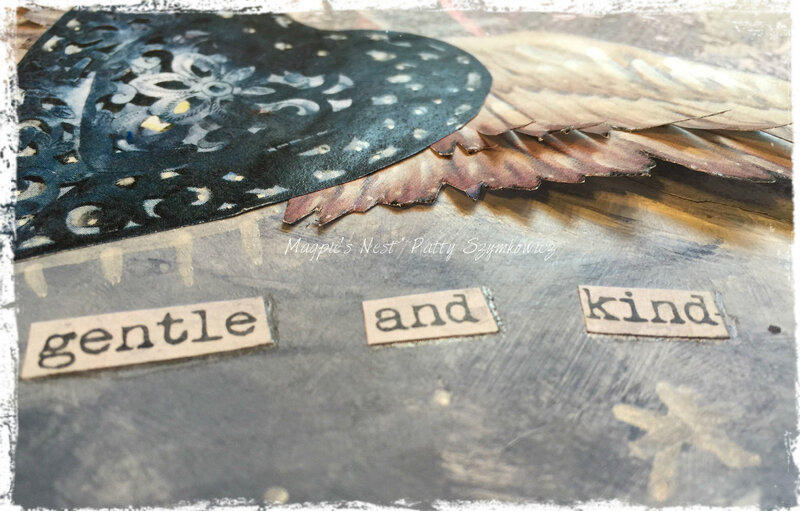 Crafting is healing! Beautiful page, lovely and meaningful quotes. Art Saves, Art Heals. Having lost loved ones in this season too. The grieving does not end, it just changes and evolves. Beautiful piece today. The poem is lovely but kind of sad too. Always hard when those anniversary’s pass, not matter how many years it is. Stay warm, and be glad you are not going to have negative number temperatures tonight! Hugs! A wonderful heartfelt post, the page looks beautiful and the words are lovely. Dear Patty I know your heart is on these lovely pages. A touching tribute, art and poem. This is both poignant and heart wrenching because I can, in no way relate to your loss that always makes you sad this time of year. Bur I can certainly appreciate the beauty of the spread you created. 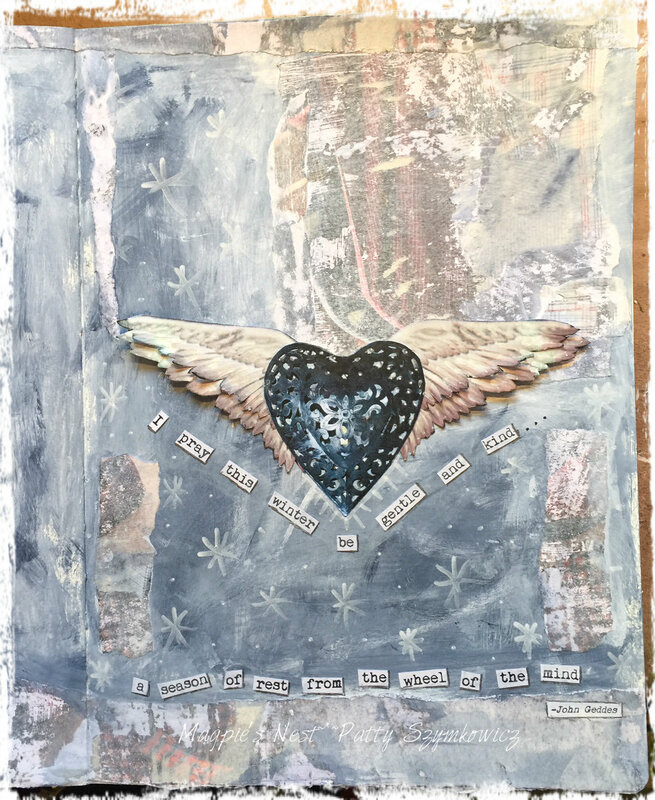 The heart may be weighed down (with adhesive), but the wings still find a way to fly free. I was really taken by the symbolism. Such a beautiful and heart full spread Patty dear.. The poem brought shivers to my arms-thank you so much for sharing your beautiful art with us!Keeping you always in my thoughts,sweet lady! Ah Patty such a good feeling as always when I visit your blog! Love the quotes so much, I have to say, but then the layerd wings!! and then the heart looks like real metall! How did you make this magic? And so happy to hear we met at Misty Mawns workshop, wohoo!! My dear Patty, It is truly a very beautiful spread, the words you printed, and cut out, say so much, and it is the most lovely page ever. So much love , in the star -and snow filled air. The beautiful wings from an angel being close ,and giving help, the light filled heart ,promising warmth,and hope for the coming days and months. That`s what fills me when seeing this beautiful page, dear friend. Thank you Patty . Wow. What a powerful and on-target poem. There is so much love in this page. So much soul. And the quote — yes, we all want winter to be gentle and kind — to our bodies, souls and hearts. The healing journey is one of challenge. You do not walk alone. Sometimes the down times are necessary in order to fully appreciate the happy ones. You’ve given us something to think about. Isn’t that just a lovely and rightly way to look at the losses in our lives. (the last poem/quote) One certainly can’t always see it that way for sure. 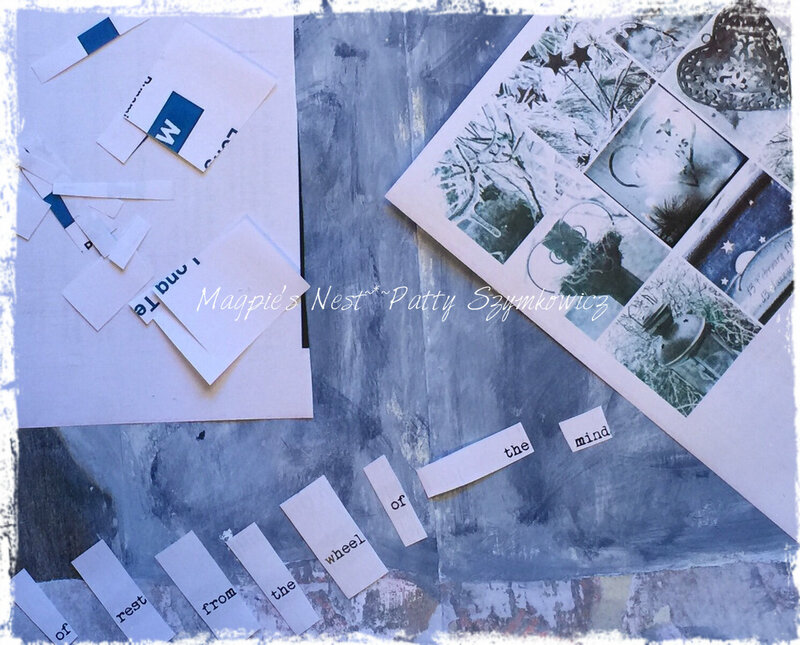 I was looking at a couple of organizing ideas right before I popped over to your blog and when I saw your journal pages with all your bits I wondered if you’ve ever shared how you organize and keep your creating space? I haven’t been able to get around to the blogs like I did for awhile so maybe I’ve missed it over the years. And, maybe it’s not something you care to share either. Your work is lovely. Peace to you these winter days…. Beautiful! How big is your new journal? 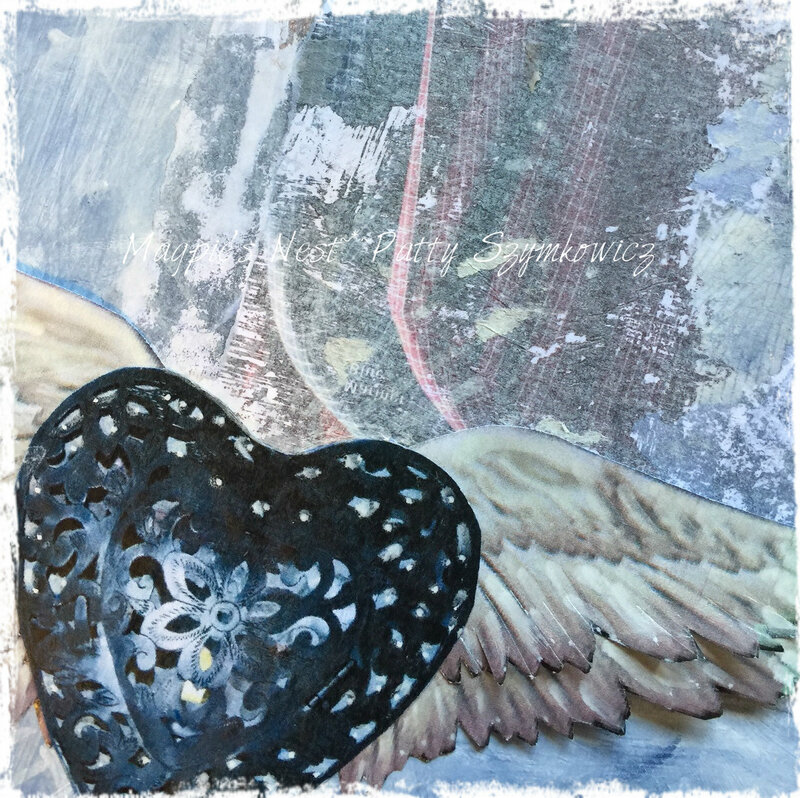 I love the art on the wings…. Hello, très beau travail sur le coeur et les ailes, j’adoreeee. L’hiver semble doux pour l’instant, faudrait quand même qu’il fasse un peu froid. This is magical, my friend!